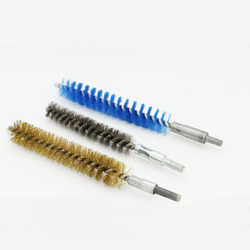 Manufacturer of a wide range of products which include double stem tube cleaning brush, condenser tube cleaning brush, single stem tube cleaning brush and steel wire brushes. We are counted amongst the prominent organizations, involved in offering a quality approved the range of Double Stem Tube Cleaning Brush. Manufactured using the high-quality raw material, our range is widely acknowledged among the large clientele. To meet diverse requirements of customers, we offer these brushes in various sizes and shapes. Customers can avail these products from us at affordable rates. Fill material sizes range from .003″ up to .010″. Standard fill materials include high carbon steel, stainless steel, brass, nylon and horsehair. The stem wire is normally plated carbon steel, but 300 series stainless steel is also standard with stainless wire. Other stem wire options include brass, copper, and plastic coated wire. We are engaged in bringing forth a comprehensive assortment of Inside Condenser Tube Cleaning Brush that has great functionality. Our professionals design this brush by making use of finest quality material & advanced techniques as per the quality norms. This brush is checked upon several parameters for delivering a flawless range to customers. Also, this brush is available in various sizes & other related options as per needs of our customers. Backed by talented & skilled professionals and rich industry experience, we are able to offer a wide range of Single Stem Tube Cleaning Brush. Our offered brush is available in various sizes & colors options so as to satisfy needs of our customers. The brush offered by us is provided in finest packing for ensuring defect free transit. Our brush is manufactured from the excellent quality of material & latest techniques keeping in mind the set standards of the industry.